Like many gamers, I’m always looking for the grail of wargames – an epic-feeling, tactical game with detail, potential for real strategy, limited luck-based elements, and that plays in just a few hours with simple rules. Admiral’s Order may not tick all those boxes, but the grand scale of it makes me want to find the time to be able to play it. The part that appeals to me is the tactical play of creating lines of ships, and turning and positioning them to attack the enemy – the sort of thing you see in historical documentaries (and what I was so bad at doing when I played Battlefleet Gothic many years ago). As you would expect, the wind direction plays an important role in your manoeuvres too. 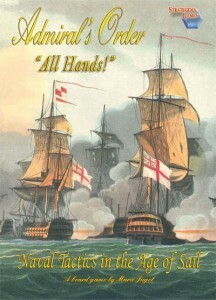 Players take control of dozens of ships of the line in different naval battles from 1775 – 1815. 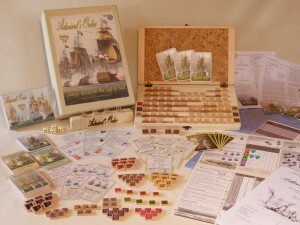 The base game contains 74 hand-made ships which do look very cool. There is a lot of detail in the game including each ship’s status being tracked individually. The game’s web site says a battle between two frigates may take a couple of hours so playing time seems to be quite long. The expansion that is available adds a further 60 ships so you can play out the whole Battle of Trafalgar, although it does say that would take an entire weekend! Totally bonkers, but it’s the kind of crazy I admire.